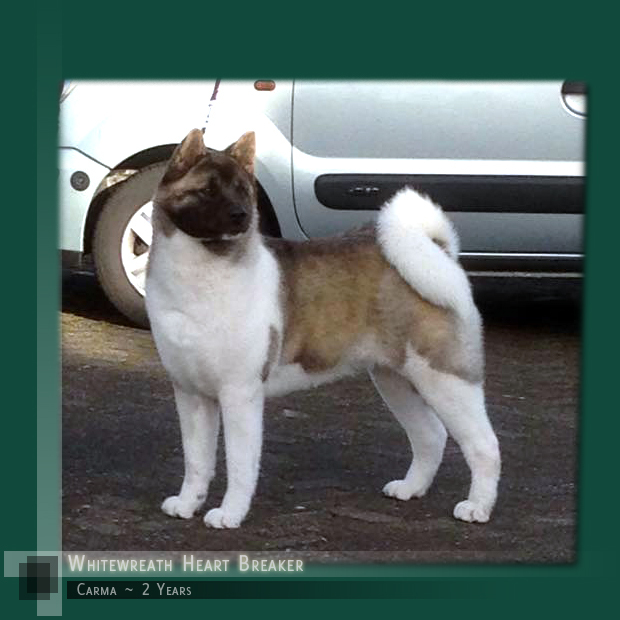 Carma is the daughter of 'Caeson' & 'India' from our 2013 repeat breeding, making her litter sister to 'Bae' and 'Karma' and sibling to older sister 'Esha'. Carma is owned and adored by our dear friend Janneke in Holland, and we wish them every happiness and success together. Carma is a super stylish and typy girl with so much elegance, she has the prettiest of heads with beautiful well set small ears. A beautiful coat of Silver and White she has excellent bone, fanbulous tight feet, superb hind angulations and the tightest of tails. With her strong black mask and little tiny 'pencil line' blaze, she has just the sweetest of expressions, to match her wonderful personality. We would like to extend our very best wishes and lots of luck for her future to her devoted owner Janneke, we look forward to seeing Carma mature.